Jan Boyd organized the first girl’s cross-country team at Sahuaro High School in 1971, and one year later formed the first girl’s track and field team at Sahuaro. By 1982, she was inducted into the Track Coaches Hall of Fame. 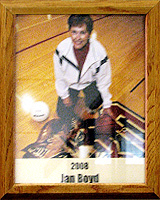 In between, Boyd’s other accomplishments included assistant women’s basketball coach at Pima College, organized the first girls divisional and state track meets in Arizona, Girls Track and Field Coach of the Year from the Arizona Daily Star and serving as assistant coach for girls basketball and volleyball matches and track and field meets. Jan has participated in many marathons, bike races, racquetball tournaments and helped organize the Tucson Sunchasers Running Club for Women. In Addition, she has volunteered at the National Sports Festival in Minneapolis, MN (1990) and the National Senior Olympics Track and Field Games in Tucson (1996).